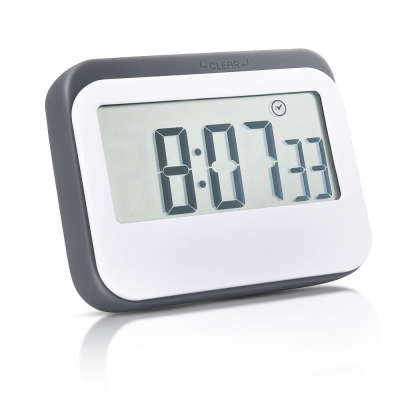 The Mudder 24 hour digital kitchen timer is combined with the function of a digital clock. When it works as a clock, it is mute and accurate, also can be adjusted quieter but faster. What's more, you will enjoy the cute design and flexible placements with its strong magnetic force and stand back. So that it is suitable for cooking, resting, sporting,doing facial mask, studying and office timing. 3. Press the button H, M or S without loose, it will adjust the time fast. 5. Press the button of minute and second at the same time over 3 seconds, it will clear the memory of timing. 6. You' d better have a bit overlook angle if you wanna get the clearest digits. 7. When it works as a clock press the start/ stop button, it will toggle the 12 hour or 24 hour timing mechanism.